A new year and new concept at Bistro Terrace. 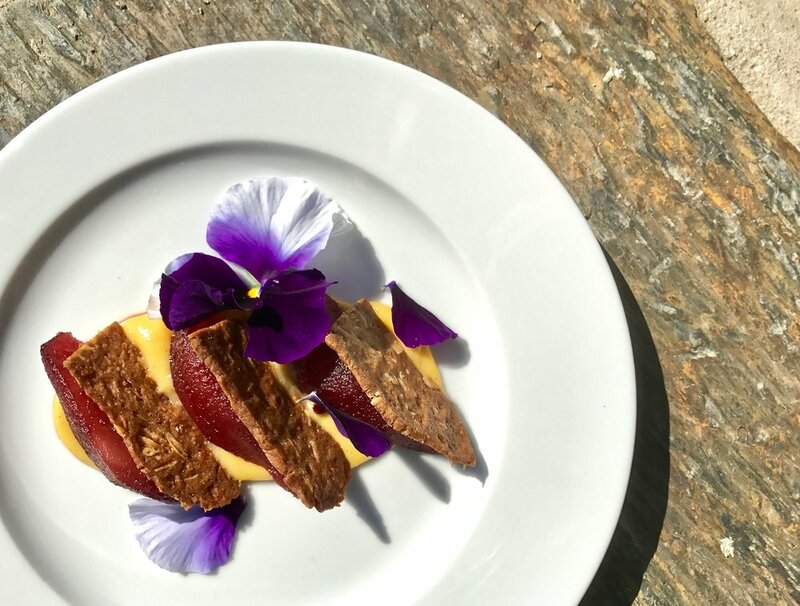 In summer 2016 brother-sister-duo Paolo and Odile Bouchard (children of Vincent and Kay, owners of Quinta do Tedo) opened the seasonal Bistro Terrace, overlooking the shimmering Tedo river. We wanted to offer tasting room visitors and B&B guests food to complement our fine Portos, DOC Red Wines and organic Olive Oil. And we did, with great success! 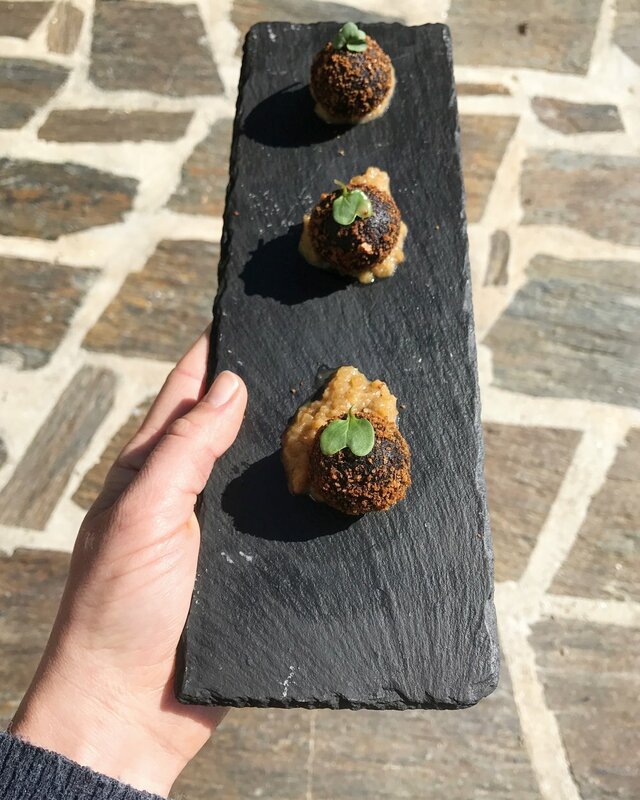 Each summer since Bistro Terrace has featured a different concept, with various chefs and a consistently young, professional and creative team to enhance our customers’ overall experience at Quinta do Tedo. This year’s concept - Tapas. Did you know that the origins of tapas date back to 13th century Spain, when King Alfonso X declared that no glass of wine should be served without a bite of food? Thus the idea of tapas, defined as "small portions of food to accompany wine" emerged. At Bistro Terrace, we serve gourmet and generously-prepared tapas that showcase Douro specialties and refined, traditional Portuguese flavors. Portuguese vs Spanish "flavors" - same name, but different. Pre-Roman Spain and Portugal were recognized as a unified Iberian Peninsula. It wasn’t until 1128 that Portugal emerged (a couple hundred years before Spain) as an independent nation. As Spanish and Portuguese histories, geographies and cultures are intertwined, so are their culinary influences. The cuisines of Spain and Portugal, countries surrounded on three sides by water, rely heavily on seafood. However, the Portuguese are the true masters of bacalhau (salted cod), which they prepare in 365 different ways (one for each day of the year!). Both cuisines feature plenty of fresh, seasonal and local produce, regional cured meats and cheeses. Based on peasant recipes that are simple, flavorful and easy to prepare, Spanish and Portuguese dishes are the perfect accompaniment to the cholesterol-friendly olive oil and food-friendly wine. The different herbs and spices used in Spanish and Portuguese cuisines largely set them apart. Saffron, paprika and parsley add fresh bursts of flavor and color to Spanish recipes. Piri piri (a small but potent pepper) bay leaf, coriander, cinnamon, black pepper and other exotic spices, that Portugal acquired during the spice trade, add heat and depth to Portuguese recipes. Portugal is also known for over its 200 different doces conventuais (convent pastries) made with egg yolks, sugar and occasionally other rich ingredients such as nuts and spices. Legend has it that 15h-century nuns invented these pastries to use up the yolks leftover from starching their laundry with egg whites. The Spanish sweet tooth favors chocolate, which was introduced from the Americas by early 16th-century conquistadors and was kept a secret from the rest of Europe for over 100 years! Since then, Spain’s fine confectionery and rich drinking chocolates have indulged many a gourmet. Spanish cuisine has influenced international cooking trends for decades, yet Portugal is only recently establishing itself as a new foody destination. 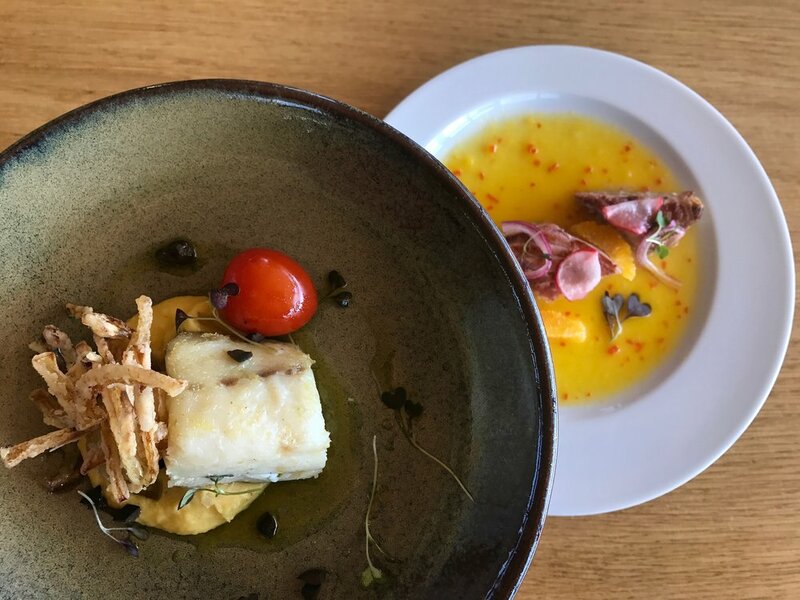 While respecting the simple flavors of a few quality ingredients, Portuguese chefs are developing their cuisine with innovation and different flavors in interesting ways. Bacalhau confit, crispy onions, olive tapenade, chickpea puree (left), seared tuna, pickled onions and radishes, pepper-orange coulis (right). Ruby-poached pears, Kay’s spice cookies, orange-vanilla cream. Morcela sausage croquettes, spiced apple chutney. For the vegetarians out there, bread-fava beans-turnip green migas, soft-poached egg, herbed olive oil. 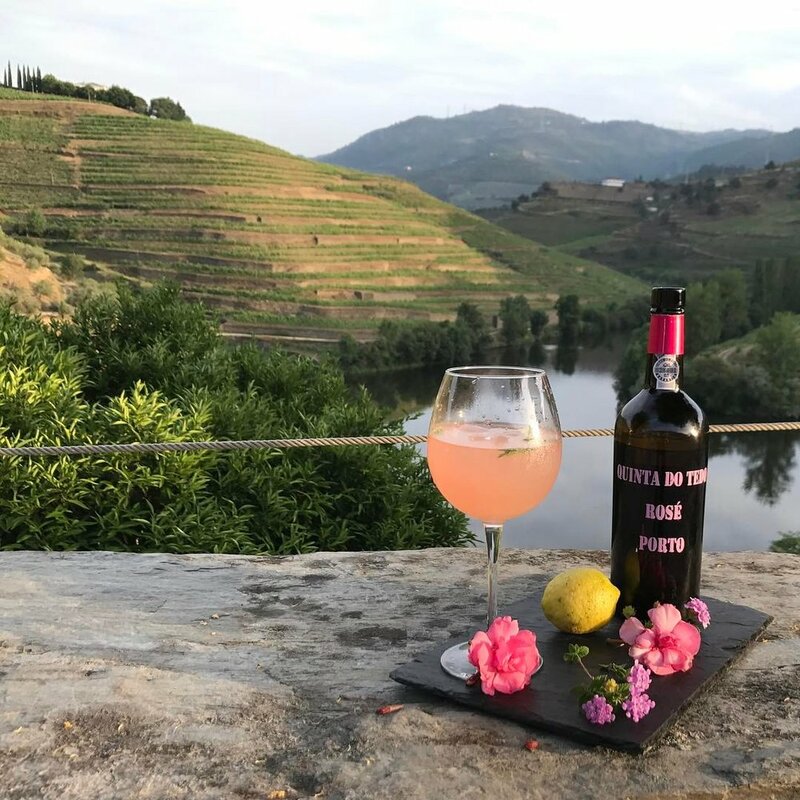 Bistro Terrace has the best views and the only Porto Rosé tonic you’ll find in the Douro Valley. You can check out our other offerings here. We hope to serve you soon!